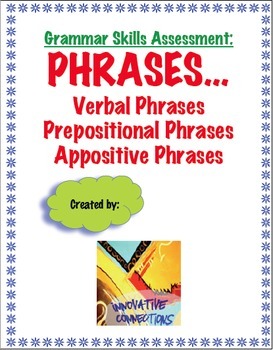 Phrases Summative assessment or formative assessment. Or, use as extra practice or test prep. It covers verbal phrases and prepositional phrases. It is a 15 question multiple choice test in state testing format. Students must be able to identify sentences containing: infinitives and infinitive phrases; participles and participial phrases; gerunds and gerund phrases, as well as be able to use the verbal phrases in various forms within sentences. For infinitive phrases, students should be able to identify the infinitive as an adjective, adverb or noun and the noun's function in the sentence. They must be able to identify prepositional phrases as adjectives or adverbs.